A Catholic Mind for business means rethinking business so that it works for persons, and not the other way around. 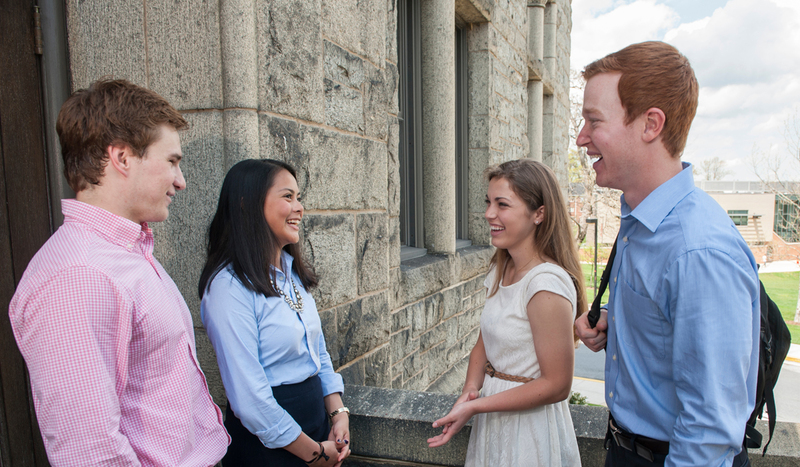 This approach is what sets the Busch School of Business apart from every other school. We don't just add a few ethics courses to the standard business curriculum. We have infused an already strong business curriculum with Catholic social doctrine, with the goal of transforming the world of business into a force for good. The mission of the Busch School of Business is to provide thought-leading education and scholarship in business informed by the Catholic principles of human dignity, solidarity, subsidiarity, and the common good. The dignity of the human person is the basis of a moral vision for society and the foundation of Catholic social doctrine. In Caritas in Veritate, Pope Benedict XVI writes, "The Church forcefully maintains this link between life ethics and social ethics, fully aware that 'a society lacks solid foundations when, on the one hand, it asserts values such as the dignity of the person, justice and peace, but then, on the other hand, radically acts to the contrary by allowing or tolerating a variety of ways in which human life is devalued and violated, especially where it is weak or marginalized.' "
Solidarity, which arises from faith, is essential to the Christian view of social and political organization. Each person is connected to and dependent on all humanity, collectively and individually. Pope John Paul II wrote in Sollicitudo Rei Socialis, "[Solidarity] is not a feeling of vague compassion or shallow distress at the misfortunes of so many people, both near and far. On the contrary, it is a firm and persevering determination to commit oneself to the common good; that is to say, to the good of all and of each individual, because we are all really responsible for all." Subsidiarity is a manifestation of human freedom and is the principle by which authority figures acknowledge the rights of all members in society. The principle of subsidiarity states that larger institutions and government should not interfere with the legitimate decision-making of smaller or lower-level organizations. The common good is "the sum total of social conditions which allow people, either as groups or as individuals, to reach their fulfillment more fully and more easily." (Second Vatican Council, Guadium et Spes, 26.) The common good should be the primary goal of society (Compendium of the Social Doctrine of the Church, 165).